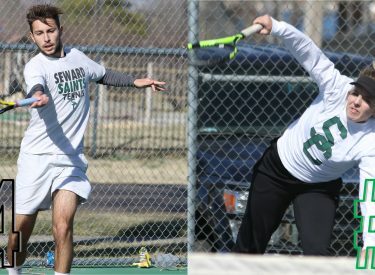 The Seward County Saints Men’s Tennis team jumped one spot to #4 in the latest ITA National Poll while the Lady Saints dropped one spot to #6 in Monday’s release. The Saints, off to a 12-2 start including wins over three top 10 teams, check in at #4 in the poll while the top three remain unchanged with Tyler, ASA Miami, and Seminole State leading the pack. Fellow Jayhawk Conference rival Cowley is #9 while Barton sticks at #16. There was a lot of movement in the women’s poll as only #1 Tyler kept their rung out of the top 20. A 9-4 start for the Lady Saints drops them to #6 while ASA Miami moves up to #2, Broward and St. Petersburg jump from outside the top 10 into the top five and Abraham Baldwin moves up to round out the top five at #5. Cowley falls from 4 to 10 while Barton moves up two to #17. The Saints and Lady Saints will be back in action at home on Friday at Blue Bonnet Park when they take on Colorado State-Pueblo in a 10:00 dual in Liberal.